Need a few limbs pruned or a tree removed? Need a new tree planted? Need the health of your tree evaluated? Time to call a Certified Arborist. See a honey bee swarm? Interested in a hive set up? Need a honey bee hive removed and relocated? Need help identifying the type of bee you have? Time to call a Bee Expert. Concerned about the health of your tree? Evaluate for Emerald Ash Borer? Time to call a tree care company who cares for both the health of trees and pollinators while making treatment recommendations. Welcome to Bees & Trees! Bees & Trees, Inc. is a locally owned and operated company in which all services are completed by an ISA (International Society of Arboriculture) certified arborist and fully trained crew. We are a family run business that takes great pride in providing the highest level of service on each and every project. We provide a wide range of both bee and tree-related services, including tree pruning, limb removal, tree diagnosis, stump removal, honey bee hive removal, hive setup, and more! Happy customers are the best form of advertising. If you know of someone that could use our services, refer them to Bees & Trees! Let Us Do the Climbing For You! Tree work can be a dangerous business, so it's best to leave it to the experts. There are many reasons you may need to call a certified arborist to your Longmont or Boulder, CO home. Maybe a recent storm has downed some branches and limbs and you need to have them removed. Or maybe you're tired of seeing that overgrown tree blocking your home's once spectacular view, and just need a little pruning. Whatever the case, the crew at Bees & Trees stands ready to help. We provide tree pruning, tree trimming, tree and stump removal, wildfire mitigation, and professional consultation and diagnosis for any tree issues you may encounter. We focus on sustainability and optimal tree health, and use organic choices whenever possible. So put that ladder away and call Bees & Trees in Longmont, CO for help! Did you know honey bees have been around for millions of years? They are vital to our environment as they are pollinators, and produce both honey and beeswax for humans. As important as they are, honey bee swarms can cause problems at your home or on public property – but we have the knowledge and experience to help. 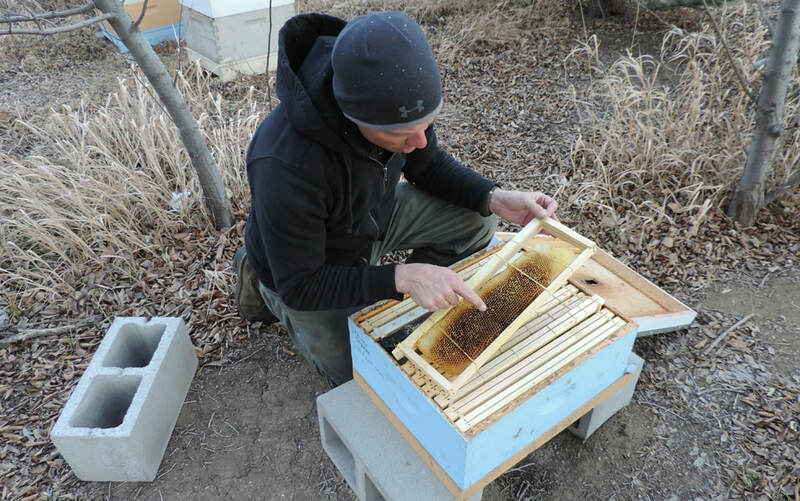 We can provide a full range of honey bee services to residents of Longmont, Boulder, and surrounding areas. We offer evaluation of your bee situation, removal or relocation of swarms, setup and education for your personal hive and other related services. If you're not sure if you have a honey bee or a yellow jacket problem, we’ll be glad to come out and evaluate. In dealing with EAB in Ash trees, as an Arborist and a beekeeper, my first goal is to educate customers. I want them to have the information to make a choice that takes into account tree health, pollinator health and options on the least toxic treatment options. I will always evaluate tree health, location and long term viability of the tree before considering treatment. If a tree has major damage or is in the wrong place such as under power lines or too close to a house, it would probably be best to remove and replant with a better species in a better location. Newly planted or small Ash trees may be best to just remove now and re plant with a different species. If a customer has a high value, healthy and properly placed Ash tree I would suggest treating the tree with TreeAzin via trunk injection for EAB control. This is administered every two years. TreeAzin is a neem seed derived product that is considered organic and is by far the least toxic to bees and pollinators. It’s control properties are specific to a handful of insects and doesn’t affect all insects blindly. Healthy trees are important to the environment also. Shade, temperature reduction, soil control, carbon sequestering, habitat and more. To me, trees and pollinators need to both be considered in long term environmental health. No treatment is perfect in my mind but TreeAzin is by far the best choice I am aware of at this time. To inquire about our tree or bee services, fill out this quick form and we'll get in touch! Copyright © 2018 Bees & Trees, all rights reserved.